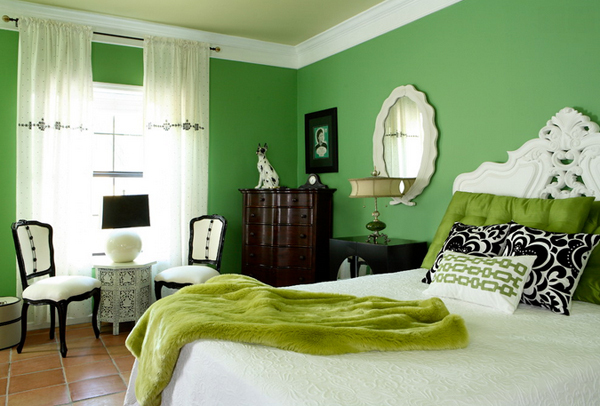 If you are looking for a color to complement with your white bedroom, choosing the color green is actually a great option because it is soothing to the eyes, comforting at some level and pretty homey because of the feeling that seems you are closer to nature. 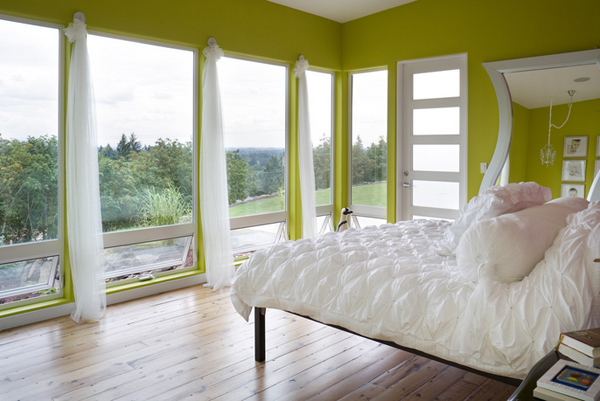 So, for today, we have compiled a list of 20 Wishfully Beautiful White and Green Bedrooms that you can check out. 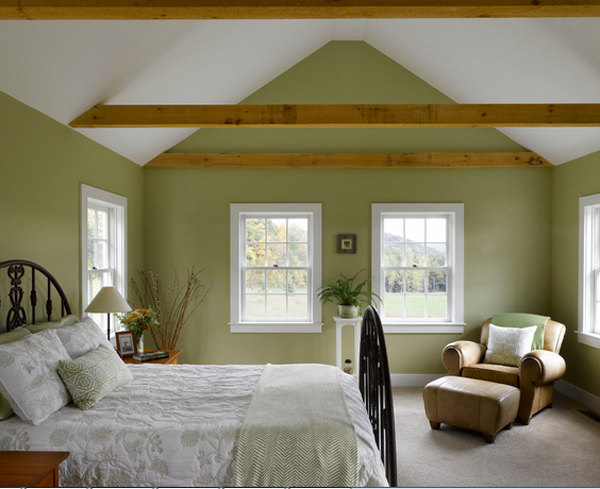 Instead of painting the four bedroom walls green and leaving the ceiling white, mix it up a bit and paint the ceiling and one wall or part of one wall your chosen green hue. Be sure to pick up the color elsewhere in the room. Even small accents of it will add visual rhythm, causing the eye to move throughout the space and the viewer to appreciate all of the lovely details. Check out the picture we have below then! 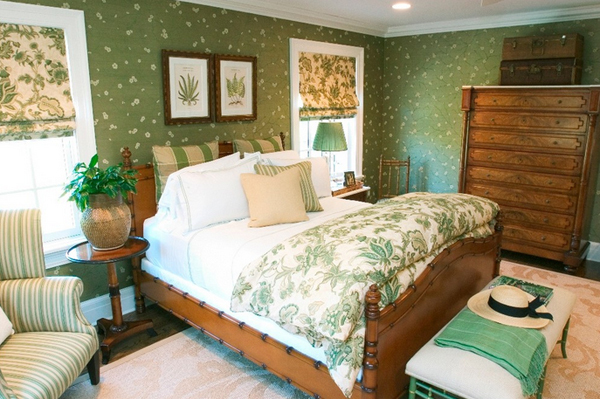 The drapery color similar to wall color accented with the greens is just stunning! I love this bedroom! If you prefer brighter, bolder colors – use whatever makes you happy. 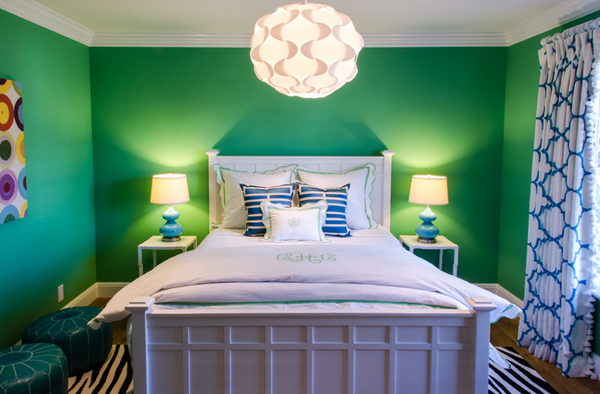 Design Theory Interiors of California, Inc.
Green paint with dark woods and black or white furniture is always a great color combination as seen in this Atlanta bedroom. Alan Mascord Design Associates Inc. 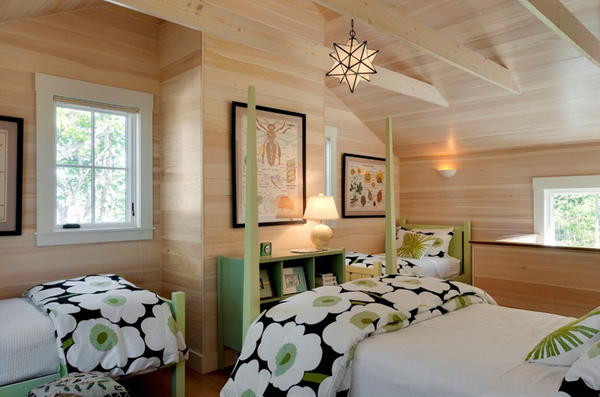 I love this bedroom with its bright olive-green walls, rustic wood floor and fluffy white bedding. I would never want to get out of bed! 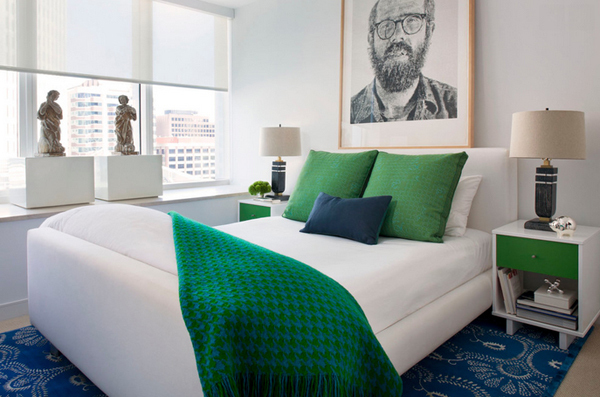 I find this fetching green bedroom appealing for the mix of bold and soft color as well as the charming furniture and accessories. The green walls really help the wood beams stand out, but the remainder of the palette remains light and soothing. It’s a relaxed, airy room that I think would appeal to many – perfect for a guest room. 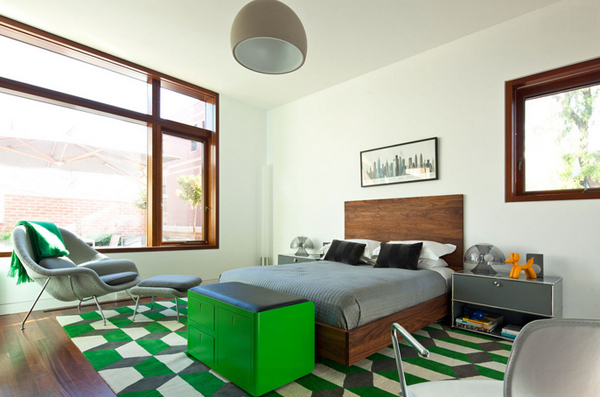 This is a more dramatic green that offers a modern, fun and youthful vibe. This assertive shade stands up well to darker, cooler wood tones. 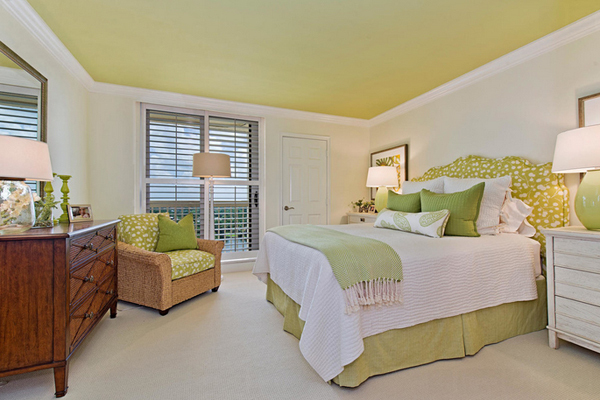 Here’s another example of a green ceiling paired with light-colored walls. While the previous example had a minimal palette of just green and white, this bedroom has many different shades of yellow-green mixed with whites and wood tones. It’s colorful but feels soft and harmonious. 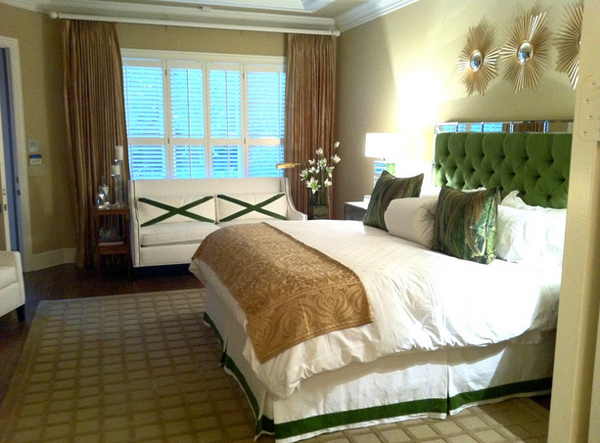 I love the green here: headboard, bed skirt, pillows and sofa pillows. But I do wish the other colors were brighter. Nothing pops like bright white and Kelly green. Glam in the bedroom. 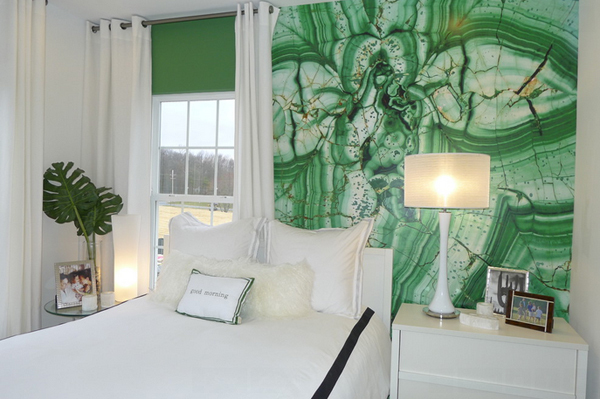 Malachite may come from nature, but it’s a high-end kind of nature. This large-scale piece on the wall is a showstopper. Green is associated with organic living. It is a refreshing hue that reminds us of nature and fresh food. While green means luck for many, it is also the color of jealousy and envy. 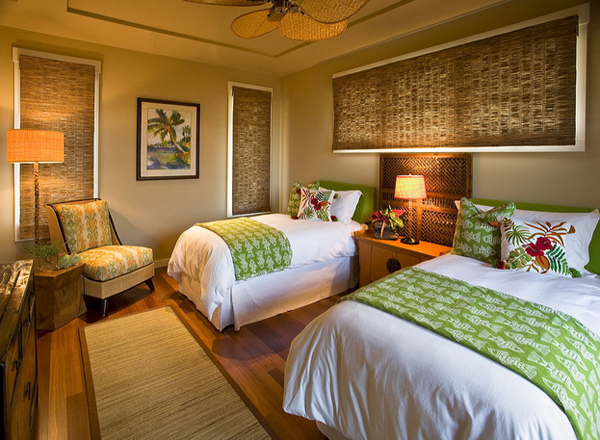 Who does not want a Hawaiian bedroom? It’s gonna feel like a vacation every day! 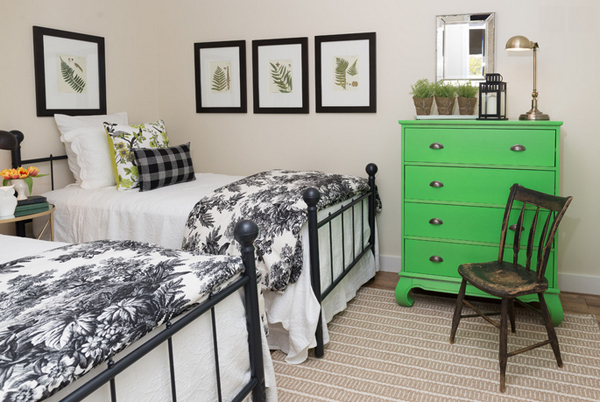 The green accents in this bedroom is sure homey and relaxing – something we all want in a bedroom. Greem walls, white ceiling, bed, and pendants – totally a combination made in heaven! A warm sage green goes well with earth tones, like browns and ocher. It’s muted and calming. The ceiling fan in this bedroom is pretty and very tropical! 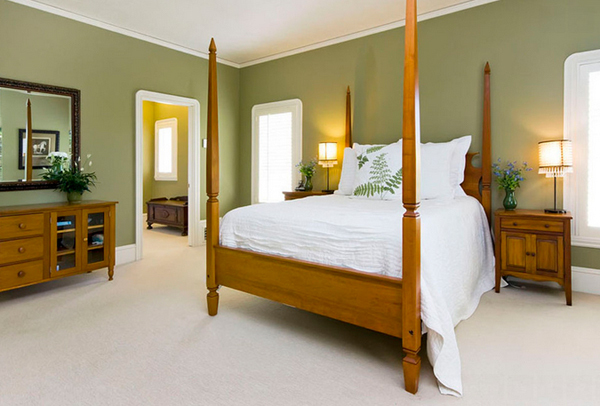 The green color in this bedroom is soothing. 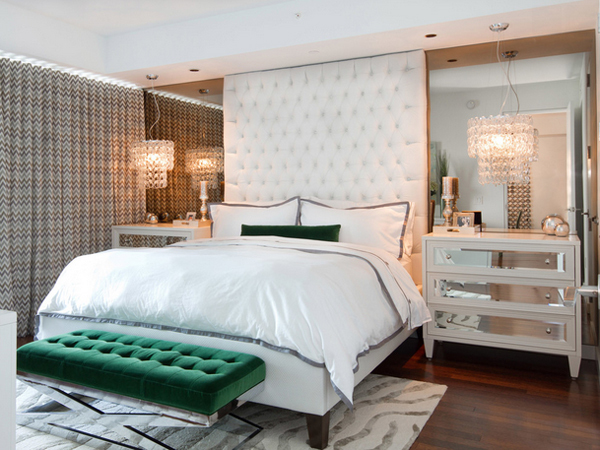 Clean and contemporary master bedroom with all white and mirror details with accents of emerald green. Whether you choose wallpaper or something less permanent (like a duvet cover), a palm leaf print is a mainline to tropical-infused Palm Beach style. It’s bold, so one accent is all you need to make a statement. Not into green-painted walls or ceilings? Not a problem. Green has been enjoying a long run as a popular hue for home furnishings, so you can find lots of pretty green bedroom textiles and decorative accessories to work in to your space. Green is one the colors that complement almost any color available in the market today, technique is always using the right amount of greens to make is either stand out or complement the main color you are wanting to highlight. Tell us what you think about this list!